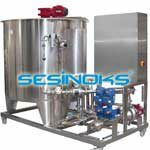 Hygiene is an essential part of the processes of the food processing, cosmetics, pharmaceutical industries as a correct cleaning of all the elements is required (tanks, pipes, pumps, etc.). 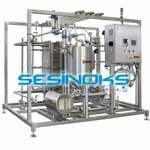 In addition, the last sterilization stage is commonly required in the pharmaceutical industry. We offer automated CIP/SIP units correctly selected and customized to guarantee a controlled cleaning and/or sterilization and an optimum efficiency without having to disassemble the process plants. The parameters of temperature, speed/pressure, chemical concentration and exposure time are accurately controlled by a system that can be configured with multiple options in order to provide the cleaning and sterilization parameters and to do it in a reliable, repetitive and verifiable manner. Two AISI 316 tanks, jacketed, of 250L for the prepration of cleaning solutions. Electric heaters inside the tank. 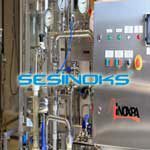 Peristaltic, piston or membrane pumps for dosing of concentrates. 4kW Hyginox SE impulsion pump. AISI 316 collectors with pneumatic butterfly valves with C-TOP. AISI 304 frame with wheels. Temperature control inside the tanks and conductivity control in the return line. Level control in the tanks. Flow control in the return line. Pressure gauge at the pump impulsion. 5 programmes: preparation, short tank cleaning, short line cleaning, tank long cleaning and long line cleaning. Manual valve activation. Plant state displaying. Change of parameters. Tested and verified in our test house. Two AISI 316 tanks, jacketed, of 1000L for the preparation of cleaning solutions. One AISI 304 tank, not jacketed, of 1500L for recovered water. Conical bottoms. Peristaltic, piston and membrane pumps for concentrates dosing. 5.5kW Hyginox SE impulsion pump. AISI 304 base frame with adjustable legs. 10″ display allows touch screen control. and long line cleaning. Manual valve activation. Plant state displaying. Change of parameters. 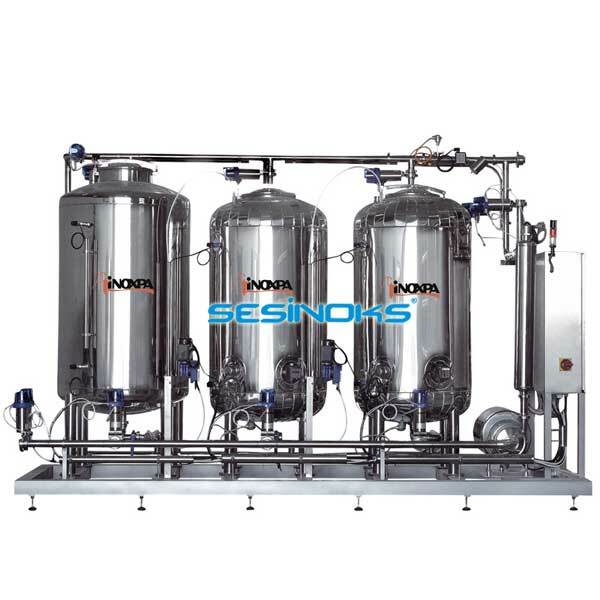 The SIP units sterilize all the process system as one unit thus reducing the number of connections necessary for its performance. 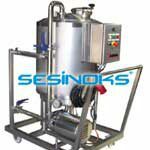 The sterilization system is controlled by a PLC and can be provided optionally either separately as a portable skid or it can be incorporated into a CIP unit as the last stage of the cleaning process. Additional tank for sterilant alternatively inline dosing. Other tank configurations (2 simultaneous lines, bigger volumes…).